Initially, the youngest winner of Nobel Prize was Lawrence Bragg with an award of Nobel Prize in Physics in 1915, but today, the youngest winner is Malala Yousafzai who received the award in 2014. The establishment of Nobel Prize was by the will of Alfred Nobel, and usually occurs on his death anniversary, the 10th of December every year. 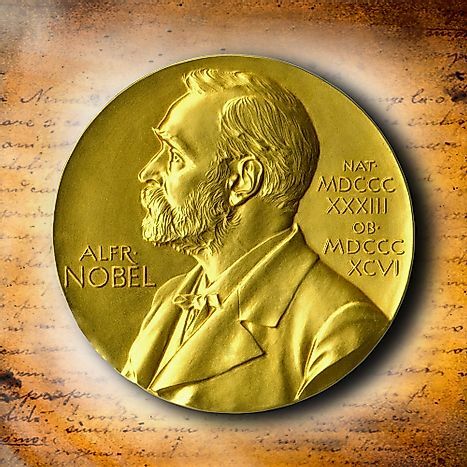 The establishment of Nobel Prize was by the will of Alfred Nobel, and it comprises of any international prizes awarded yearly for outstanding work in physiology or medicine, physics, literature, chemistry, peace promotion, and economics. The award of Nobel Prizes, the first award being in 1901, usually occurs on Alfred Nobel's death anniversary, December 10 every year. Swedish learned societies appoint boards of deputies to decide the awards, except for the peace prize that is determined by the boards designated by the Norwegian Parliament. Some of the earliest winners of Nobel Prizes include Jean Henry Dunant, Sully Prudhomme, Emil Adolf von Behring, and Wilhelm Conrad Rontgen; all won in 1901. As of the year 2016, there were 579 prizes to 911 laureates. Initially, the youngest winner of Nobel Prize was Lawrence Bragg with an award of Nobel Prize in Physics in 1915, but today, the youngest winner is Malala Yousafzai who received the award in 2014. Here is the description of these two Laureates alongside their Nobel Prizes. Malala Yousafzai won the Nobel Peace Prize of 2014 when she was seventeen years old. She received the award alongside her winner mate, Kailash Satyarthi, where each was awarded half the prize for their continued struggle to do away with the suppression of young people and children, and the fight for the right to education for all children. Malala was born 1997 in Mingora, Pakistan, and she was living in the United Kingdom at the time of the award. Her father was active in educational issues, hence reinforcing her work on education that contributed to the winning of the Nobel Prize. Malala Yousafzai began fighting for girls' right to education when she was eleven years old, and after her suffering that resulted in an attack from the Taliban gunmen in 2012, she continued with her advocacy, making her the top advocate for the rights of female children. Lawrence Bragg jointly won the award in 1915 with his father, William Bragg, for using X-rays to analyze the crystal structure. Lawrence held the title of being the youngest Nobel Prize winner until 2014 when Malala Yousafzai took the title. His birthplace was Adelaide, Australia (March 31, 1890) and his death place was Ipswich, United Kingdom (July 1, 1971). His affiliation when he received the award was to Victoria University in the United Kingdom. Lawrence Bragg collaborated with his father in the scientific field and began to carry out his Nobel Prize-awarded work at the age of 23. He and his father did their research on diffraction of X-rays by crystals following the inspiration of Max von Laue's discovery of the patterns of X-rays diffraction by crystals. They managed to come up with the relationship between wavelength, incident angle of X-ray, and the atomic distance in the structure of a crystal. From that relationship, it has become easy to study the different structures of a crystal and to compute the location of atoms in those structures.